There is nothing chic about squinting in the sun, so don’t get caught out without a pair of stylish sunnies! Women are spoilt with number of accessories we can wear; bags, shoes, jewellery and more, not forgetting chic sunglasses that protect your eyes and make you feel like an A-list celebrity at the same time. If you’re going on holiday, a pair of sunglasses is an absolute must! When you grab some new beach buys, be sure to plan your budget to factor in some sunglasses alongside suncream and other holiday necessities too. If you’re scraping the barrel, don’t resort to cheap sunglasses from the market. 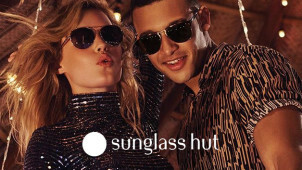 All year round, you can rely on vouchercloud to bring you trendy deals on a huge range of eyewear from a number of top end retailers, so grab your share of our sunglasses discount the next time you’re preparing for sunnier climates. With savings available at dedicated online retailers such as the Sunglasses Shop and Fashion Eyewear London, you’ll be surprised by the budget-friendly deals on covetable designer sunglasses. If you’re tempted by all the glamour of luxury eye wear, you’ll love the selection of high fashion brands including Chanel, Prada and Dior. Prefer an iconic street-style look? We’ve got discount sunglasses offers for on-trend Ray Ban sunglasses too, so if you’re after their classic Aviators or Wayfarers, you know that investing in Ray Ban sunglasses is buying a timeless accessory that you’ll wear summer-after-summer.